Poetry is perhaps the purest form of written expression. Novels have characters, songs have rhythms, fables have morals…they all rely on various trappings to enhance the words. But poetry is wholly dependent on the words. The words are everything, from the shape and the meter to the meaning and the metaphor. 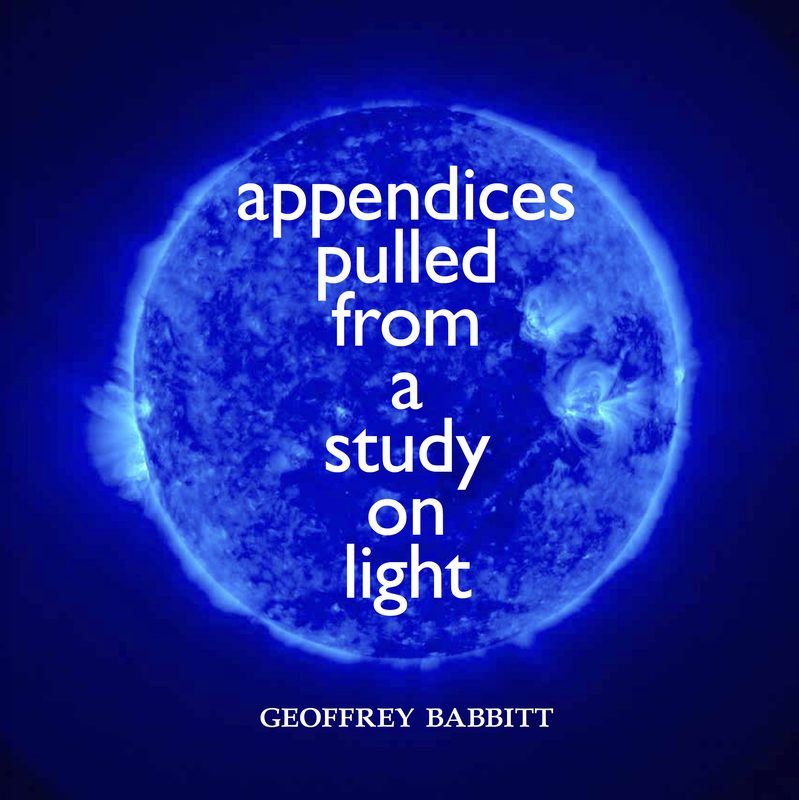 In Appendices Pulled From a Study on Light, Geoffrey Babbitt uses poetry to explore the very nature of creative expression itself, and it’s a truly unique, humbling experience to read. At first glance, the work appears to be an interpretive, multimedia examination of a single controversial act: St. Columba’s decision to make a copy of a book of psalms. You don’t have to be familiar with St. Columba or the act in question, as part of Babbitt’s journey includes detailed descriptions of Columba’s actions and a thoughtful discussion of how history recalls the act in question. But there’s so much more to unpack here, and we’ve barely begun. It starts with a circle of light, a halo, launching the reader on a journey, a round-trip exploration of thought and word and deed that takes you around unexpected corners before returning you to the starting point, forever changed. Although topics and expressive forms change and evolve, ricocheting between different styles, each successive piece builds upon the themes of the first. The iris widens to accept more light, to broaden horizons, to set the stage for more to come. The work, as a whole, plays beautifully on the contradictory nature of poetry itself. Every poem is about something; it has a specific meaning and purpose behind it, as intended by the poet. And, yet, the reader can find personal truths within a poem that, perhaps, the poet didn’t intend, the poem remaining just as rich with meaning. I daresay it has new value, even greater value, instilled by the reader’s own realizations and internalized connection with the piece, irrespective of the poet’s initial inspiration and intended message. “Our metaphors reflect us back onto ourselves,” as the author says in one of many prose pieces that almost feel like spoken-word pieces, personal reflections that serve as interruption and world-building at once. Whether it’s delving into the purpose of using illuminated manuscripts at all (as opposed to simpler manuscripts) or questioning something as simple as the meaning of the word “likeness” by using the story of Jesus resurrecting Lazarus as an act of restoring or birthing something in one’s own image, Babbitt uses the template of Columba’s act as a launchpad for a voluminous and emotionally exhaustive quest to find why poets and monks alike sought to create these miraculous works of written art at all. Prose pieces like these are interspersed throughout, and, like the poems themselves, these prose pieces serve two masters, providing backstory and insight while also serving as commentary on the work itself. Some pieces even include side notes, like the marginalia of high school Shakespeare texts, offering explanations, and necessary context to appreciate the piece. In this case, though, the context can be deeply personal, heartbreakingly evocative little touches that enhance the story by revealing the narrator. It’s partly confessional, partly therapeutic; at times, it’s as if the author suffers from Impostor Syndrome evoked by plumbing the depths of St. Columba’s act. Both Columba and Babbitt are essentially on trial here, as putting pen to paper—either in creating a new work or creating a new copy of an established work, which itself will be in some way unique—unites them both. That duality, that shared purpose, goes all the way back to the title, Appendices Pulled from a Study on Light. It could be literal, discussing Babbitt’s scholarly additions inspired, at the very start, by the sainthood of Columba. But it also implies something deeper and more personal, an act of self-surgery as Babbitt “pulls” something both vital and extraneous from his own efforts. Returning to Babbitt’s words themselves, a depth of forethought, wordplay, and the linguistic facility is revealed by even the simplest phrases. “Auras unpinnable” leaped at me from the page, resonating as I read and reread each poem. There’s no doubt that every word was painstakingly chosen. And, yet, the work does not reek of the lamp. It feels fresh, vibrant, honest. A labor of love that wasn’t laborious, if that makes sense. The combination of meter and metaphor here is exquisite, reflecting the work as a whole. Appendices is as beautiful as it is experimental, asking hard questions not only about St. Columba, but creation and inspiration. Does it devalue or disrespect the original to reproduce it? Does the act of copying become an act of creation under the right circumstances? And, if that act of copying serves as a moment of inspiration, does the new work springing forth owe a debt to the copied original? Is it invalidated by the act of copying that inspired it, or does it honor, even enhance, the original by existing in the first place? Babbitt allows you the time and space to wrestle with these questions, even as his own exploration of a single moment of Columba’s life has him reflecting on his own, including the act of creating Appendices. This very book is born under similar circumstances, copying the story of St. Columba, only to build upon it. Quotations are copied, excerpts from texts, and images from iconic visual works…all are lovingly sprinkled throughout the text. It’s an impressive way of getting the reader to ponder every aspect of a particular book, from titles and imagery to the use of the margins themselves as both spacing and note-taking space. St. Columba committed a controversial act by making a copy of a book, and Babbitt breaks down the act as he breaks down the book-building process itself. It’s a matter of exploring a moment in time atom by atom from every conceivable angle, and when you think the book has reached its narrative peak—melding history, philosophy, literary analysis, and confessional creative nonfiction—Babbitt finds a new quote, a new revelation, a new nugget of historical context to reignite the spark, continuing this study of light. That progression becomes clearer on successive reads. On my second trip through the book, I trusted Babbitt more as we moved gradually from St. Columba’s physical act to Babbitt’s mental gymnastics and onward to my own thoughts and impressions of the book. Babbitt and I became partners on this trek, accomplices with St. Columba, and the poetry feels more personal. Phrases like “we dream rain” are as welcoming as they are self-confessional. As his poetry revealed more of Babbitt’s thoughts, I found my own curious reflections in his words. I’ve been through the book five times now, and, each time, I find greater depths. The piece, as a whole, continues to coalesce into a uniform narrative, even as each individual poem and prose piece grows more complex, deeper, like a Mandelbrot set. More connections emerge—specific word choices repeated between poems, for instance—and the network of the book itself is woven a little tighter. This isn’t a book you whip through in one sitting, or on a train ride to work, or on a beach during a summer vacation. It’s not a lark. It’s an odyssey, a book that doesn’t merely invite, but practically demands to be pondered, dwelled upon, and mused on for hours and days to come. 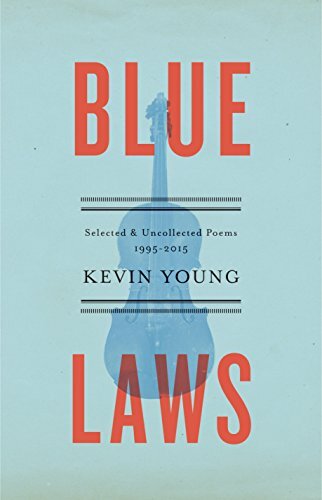 Different poems spoke to me in different ways, depending on which trip from cover to cover I was on. A poem that failed to resonate on a first or second pass would suddenly erupt with meaning on a third or fourth read. Some ignited my synapses immediately. Others have yet to leave an impact, through I have no doubt that, in time, they will. It’s a living, breathing, evolving piece of art, a long strange journey that doesn’t end with the turning of the last page or putting the book aside for the time being. It percolates, it tempts you back for more. It’s like nothing I’ve ever read before. 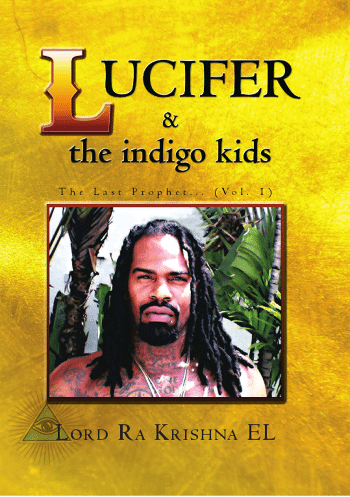 A melange of metaphor, musings, and meditation, a history book steeped in 3 AM coffee-fueled discussions, an art book projected through the lens of one man’s personal experiences, the legacy of spoken word and illuminated manuscripts alike. 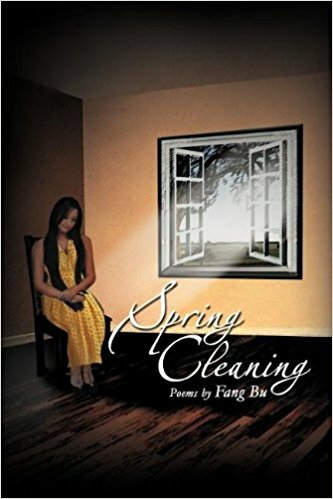 It might be a first book, a freshman effort for an established poet, but it is built on the shoulders of a literary tradition going back centuries, feeling fresh and classically dusty all at once. Appendices Pulled from a Study on Light is a testament to how poetry can take us where no other written work dares to tread.